Belatedly, I'm answering the meme that Regina Clare Jane tagged me with last month. Thank you for making me think and write! I was starting to become myself. I had recently moved to Manhattan, was knee-deep in the nightmare of selling my old apartment, was trying to find the guts to quit a slave-like job, and had just decided to learn something new: rollerblading. And my friend M. was trying to convince me to go to his synagogue, which had cool music and a reputation as a good place to meet other single New Yorkers. I was wary of religious stuff and thought it sounded cult-like, but figured I'd give it a chance one day (it took another year) because M. was a sensible guy. Pretty much the same as now, only less calm. Not a lot less, but every little bit counts. What were you doing a few hours ago? Walking in Central Park, watching white and yellow light dance in between the lace of green leaves, listening to an orchestra of birdsong, laughter, and rumbling buses. We were in The Ramble, a tamed wild forest ribboned with paths that suggest Victorian propriety about to burst its seams. Even though I rarely visited as a kid, Central Park always makes me feel like a child waiting for the wonderful unknown to peer over the next hill. I kept thinking of one of my favorite books, Robert Louis Stevenson's A Child's Garden of Verses, about a boy and girl who test the limits of their dreams but always end up safe at home, tucked in bed. 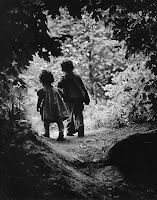 Or the W. Eugene Smith photo from The Family of Man, the book of the famous 1955 MoMA exhibit, of two children holding hands and walking into sunlight. In Central Park I'm always ten years old. There's just one: Ben & Jerry's New York Super Fudge Chunk Frozen Yogurt. OK, two: Ben & Jerry's Chocolate Chip Cookie Dough Frozen Yogurt. Yes, I live right next door to a Ben & Jerry's, proof that God has a humorously evil side. Every Beatles song ever written. Not kidding. Also "Si, ch'io vorrei morire," by Claudio Monteverdi. Did I already say not trusting in myself?